Banibanoo is another succulent place to visit — when you go, you will understand why I’m telling you this. Banibanoo is an Iranian restaurant hidden in Mártires Concepcionistas street and it’s truly a surprise for the palate. I recommend starting out with their refreshing water with mint, rose petals and honey. Its owner, the super chic chef Bani, whets your appetite with traditional dishes from his country. I suggest you try 3 of their dishes (all delicious) in a kind of combination dish that also includes drink and coffee. I’m a fan of rice and vegetables, and here you can try rice that has a mixture of flavors ranging from oranges to mint. 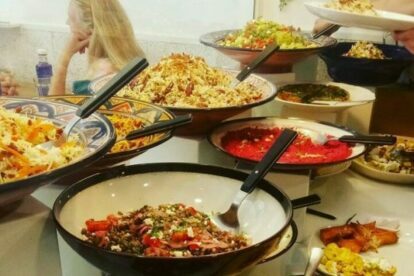 All the dishes are colorful and the aubergines with yogurt are delicious. The desserts look like they’ve come out of a movie, and they are all made by the Banibanoo team — there is nothing industrial here. It’s a fabulous option if you want new flavors, color and something exotic in your day. I recommend you book in advance or call, because sometimes there is no space. Or if you don’t want to move, you have the option to have everything delivered to you.